Nicely appointed, bright, and spacious with open floor plan and modern amenities in one of the oldest and largest historic structures in Leland. Hardwood floors throughout with new carpet in back bedroom and stairs. Granite counter top in bathroom with cast iron tub and tile and Full washer and dryer This 1,100 sq. ft. apartment sleeps 4-6(4 adults maximum) comfortably with two private bedrooms (Bedroom 1: 1 Queen Bedroom 2: 1 Queen & 2 twins). Ideal for a family or two couples. Bedrooms are located on opposite ends of the apartment. Walk everywhere. Good repeat customer clientel. Hardwood floors and a knotty pine bedroom compliment this historic building. Large fully equipped kitchen with seating for six. Private apartment has no neighbors but is in the heart of the Village. Dedicated Parking and only 100 feet from Fishtown and the Harbor. Walk to Grocery store and fine restaurants. A very short walk to two public Beaches. Private, quiet, yet in the heart of it all! Boat Launch for Lake Michigan or Lake Leelanau 100 yards in either direction. After visiting Leland several times over the last 20 years, my wife and I decided this area was the best place to raise our family. We moved here from Ann Arbor in 2003 with two boys( 1 year old and 3 year old), two goldens and no great plan. We still have no great plan but there is no better place for two boys to run and play. Meanwhile, the parents get to appreciate the beauty of the lakes, sunsets, beaches, and nature that surrounds this area. I have visited every state except Hawaii and there is no place quite like Leland. As long as Leland has been a village the Harbor House has serviced the community. Since 1863, the building has changed occupants over the past 150 years from a Post Office, Meat Market, Grocery Store, Hardware, Retail and Ice Cream. Surprisingly, over the last 100 years the building has only had 5 owners. The History of Leland goes hand and hand with the Harbor House and preserving, owning, maintaining and being a part of this history has been my pleasure and joy. Very close proximity to the Public Beaches; Historic Fishtown is directly across the street from your front door, The Harbor is barely 100 yards away and you could spend your entire week in this rental without ever having to move your car. Grocery Store, Fine Dining, Family Dining, Charter Fishing, Specialty Retail Shopping, Sugar Sand Beaches are all within a couple minute walk right outside your door. It would take longer to drive to any of these wonderful places than it would to walk. This apartment was perfect for 4 friends in early spring. It was very clean and had everything we needed for 3 nights. The host was very easy to work with and was reachable when a question arose. 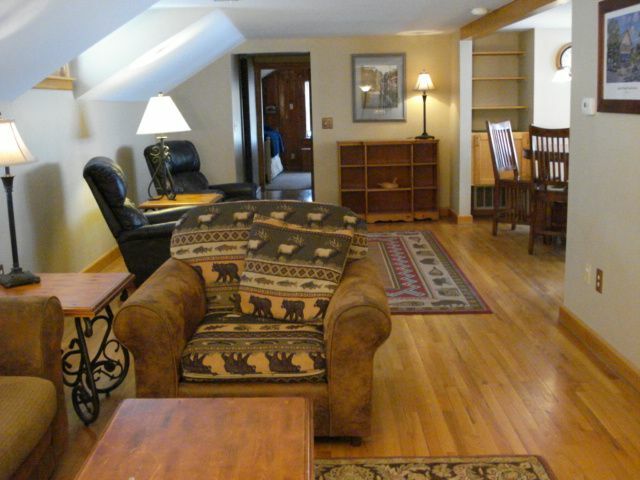 The apartment is in the heart of Leland and has parking which is at a premium in the busy season. I recommend this apartment without hesitation. Beautifully appointed and very clean and cozy. Perfect location. This is a delightful apartment in the heart of Leland. We enjoyed every minute. Our family had a great time! Clean, plenty of room, warm during the winter, right in town for easy shopping and walking, thank you! Loved the place. Perfect for two couples. Great stay. It was clean and quiet and met all of our needs. We loved that we could walk to the beach, restaurants, fishtown, a grocery, and shops. The rental is very spacious and the bathroom was nicely updated. Fantastic location. Well-stocked kitchen. Nice bathroom and living areas. Stairs to the apartment we’re rather steep, but manageable. A few mornings we were awoken by the sounds of garbage truck back-up alarms, but the location and price made up for these minor inconveniences. Really appreciated the coupon for ice cream at the Harbor House and gift card for the VI Grill in Sutton’s Bay!